The precious little people that made up our kids church were bouncing through doorways, scooting under pin pong tables, and ducking around railings. As I tried to herd our cookie infused kids towards their parents, a lady pulled me aside to tell me that her grandson was ready for baptism. I was a completely caught off guard. Her grandson was a pleasant, little guy. But he was at best a casual church attender with a shaky knowledge of the gospel, and a passion for M17 video games. Over the course of the next few weeks, the church’s pastor and I discovered that this grandmother was not motivated by a low view of baptism. She was driven by a heavy burden of spiritual responsibility. She (like many other Christian parents and grandparents) loved her grandson. Being the main Christian influence in his life, the grandmother brought her grandson to church every chance she got. At some point, she had assumed the responsibility for her grandson’s salvation. Now, she wanted to get him baptized in an effort to get him eternal life. But the great news is that we as parents and grandparents are not responsible for saving our little people. We can’t and we are not supposed to. God saves! As parents and grandparents, we are called to preach the gospel to little people through our life and words. This is a task is a task we can do with the Lord’s help! Before we begin plopping little people down in plastic pews, we have to walk with Jesus. In Deuteronomy 6, we read that we are to, “careful to do” all the commands of God so that it “may go well with you” (Deut. 6:3). Jesus reiterated this command in John 12:26a saying, “If anyone serves me, he must follow me; and where I am there will my servant be also.” If we want our children to follow Christ, we must walk with Christ day in and day out. We need to let the Word of God drive our actions at home, at work, at night, in the morning, and at every point of our life. Every aspect of our lives need to daily reflect transforming power of the cross. If we don’t, our little people will know. In addition to being candy lovers, our children are also gifted hypocrisy detectors. They may not say it (because quite frankly most two-year-olds have yet to add hypocrite to their vocabulary), but they know when our actions deny our words. If family worship is a prayer during a commercial timeout of the final four, our little people know that you love Georgia Bulldogs or more than gospel. And when we mess up by skipping a family devotion to watch the last episode of The Bachelor or by angrily snapping at our son when he interrupts our game of angry birds, we can still use the situation to proclaim Christ. There is no stronger testimony of the gospel to a child than of a parent humbling asking forgiveness and repenting from of a sin. By humbling ourselves, we show out little people that the power of Christ is real and brings about real life change (I Peter 2:24). Let’s walk in truth. God is the good, all-powerful, and just creator of the universe, existing as one God in three persons. Duet. 4:35; Ps 47:7-8; Col. 1:16-17; Matt. 28:19. Adam and Eve sinned bringing death and suffering into the world. Because of sin, we now are all sinners deserving of death because we have all sinned. Gen 3:1-7; Rom. 5:12-21; Rom. 3:23. Christ came to save us from our sins by living a perfect life, dying on the cross, and rising from the dead. Heb. 4:15; I Peter 3:18; I Peter 1:3-5; I Cor. 15:1-9. Repent of your sins and trust Christ as your Lord and savior. John 3:16; John 3:36; Rom. 10:9; Act 2:38. Put on the new man created in Christ Jesus. Eph. 4:24; Col. 3:10; Matt. 3:8; 2 Cor. 5:17. 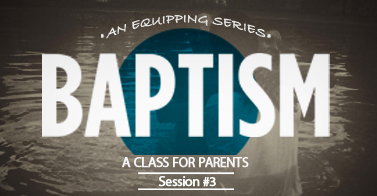 Now practically, we do not need to have “organized” clinical gospel sessions with our kids. Yes, we should embrace some form of family worship where we can work through the gospel together as a family by reading through scripture and/or devotional materials. But, gospel proclamation is not limited to the family room. As Moses makes clear in Deuteronomy six, we are to instruct our children in righteousness on the baseball diamond, on the floor of the den as you wrestle, and when you tuck your little gal into bed. We are to see every life circumstance as having the potential to lead to a spiritual conversation. Preach the gospel! By laying a foundation of gospel proclamation, we get the amazing privilege of playing an instrumental role in our child’s spiritual life. Faith comes through hearing (Rom 10:17). If we faithfully proclaim the gospel with our words and actions, it’s very possible that we as parents will get to lead our children to Christ. Again, this is what Moses anticipates in Deuteronomy 6:20. He anticipates that little people will to turn to their parents for guidance about reaching eternity. All of our little guys and gals are sinners born with sin blackened hearts. God must save them just as he saved us. And the Holy Spirit is like the wind, refusing to be manipulated by well-meaning parents and grandparents (John 3:8). But here is the good news. We are not called to save little people. We are called to point them to Christ. This we can do. And until the day we see our little people express and demonstrate faith in the one true God, I invite you to join me in fervently praying for their salvation! I am living the Christian life well? Are there things such as money, pleasure, sports, shopping etc. that come before Christ? Have you asked your spouse and children to honestly evaluate your life? Are the sins you need to repent of and patterns that you need to change? What are they? Do you have family devotions? 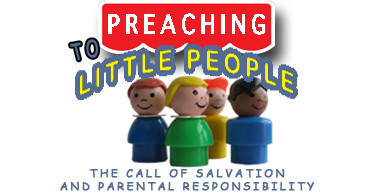 Do you preach the gospel to your little people? Fitzpatrick, E., Newheiser, J., & Hendrickson, D. L. (2001). When Good Kids Make Bad Choices. Eugene: Harvest House Publishers .